This is our sort of dress! Designed to contour your body, the drawstring detailing defines the waist but doesn’t restrict your movement. The Relaxed Drawstring Dress from the Maker’s Atelier can be gathered in as much or as little to suit you and your style! We’re loving the latest sewing pattern from The Maker’s Atelier. This stylish dress sewing pattern has a relaxed fit, long sleeves and lovely drawstring detailing. It’s designed to hug your shape but without being too clingy. The full length wide sleeves are finished with a deep cuff to complement the deep round or turtleneck. Make in light to medium weight fluid woven fabric like crepe constructions in wool, silk and viscose mixes. The dress shown here is made with luxurious poly/viscose crepe, which is also available from The Maker’s Atelier shop. 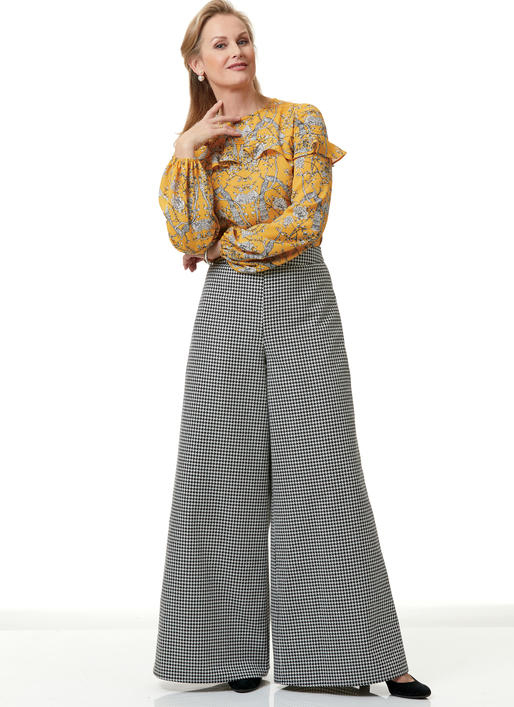 The Chiara Pants are a flattering and stylish wide leg pant with a flared hem, front and back darts, side zipper opening and waistline, which is finished with a neatly stitched down facing. The pants look fabulous worn casually or dressed up, cropped or made full length. Fabrics suitable for this pattern include non-stretch medium-heavy weight wovens such as linen, wool faille, wool crepe, polyester and viscose blend crepe, heavy drapey silks and medium weight denim. Available in sizes 6-16 (AUS). The Miss Sophie Top PDF pattern is a comfortable and pretty top that has a relaxed fit and features a split sleeve option with gathers and cuff. The top also has a scoop bound neckline with a front keyhole. Made from gorgeous floaty fabric it’s very flattering and can be worn with skirts or trousers for lots of occasions. This sewing pattern is suitable for advanced beginners+ and is available in sizes 6-26 AU (2-22 US). This trouser sewing pattern is high-waisted and features back welt pockets, front fly with zipper, side pockets, and waistband with five belt loops. You can choose between two leg sweep options: 50cm (19.5 inch) and 58cm (23 inch). The trousers have a 80cm (30.5 inch) inseam, but the length is easily tailored to your height. The trousers also feature a contoured waistband and deep front pockets. You’ll need to be an intermediate seamstress to handle bindings and a front zipper with fly and facing. The instructions are easy to follow and have illustrations for every step. Classic tailoring gets a curve-friendly update with the Chilton Trench Coat. This timeless fully lined coat pattern from Cashmerette features a single-breasted bodice, two hem lengths, belted waist, and a kick pleat on view A. An ideal fit is easily within reach, thanks to sleek princess seams and a comfortable two-part sleeve design. Lovely details such as its two-part collar, cape, epaulettes, and double topstitching, make the Chilton Trench Coat a brilliant complement to any outfit. As you would expect from curvy patterns from Cashmerette, this sewing pattern comes in a wide range of sizes from 12 to 28, with cup sizes from C to H. It’s the perfect pattern for mid- to heavy-weight wovens such as heavy cotton (gabardine or twill weave) or waterproof raincoat fabric. If using wool, use mid-weight only. The Aveiro Cardigan sewing pattern is great for when the temperature varies throughout the day in autumn. 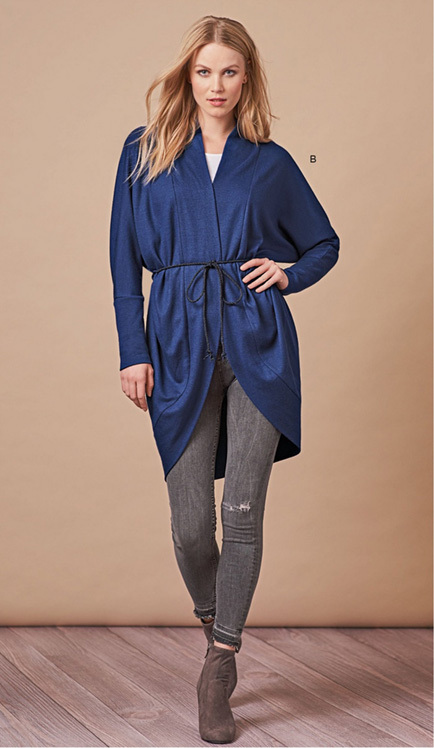 Designed for knit fabric, this smart, stylish and functional cardigan pattern comes in four bodice lengths (long, regular, short and bolero) and four sleeve options (long cuff, long, 3/4 length and short). Any sleeve option can go with any bodice length, so you can mix and match to your heart’s content. The cardigan features a V-neck front open style with patch pockets and optional snap closures. This is a great sewing pattern for beginners to get use to working with knit fabrics and comes in a wide range of sizes from 00-20. The pattern now includes an additional large format file (size A0 paper) so you can uploaded or take it to your favourite print shop. 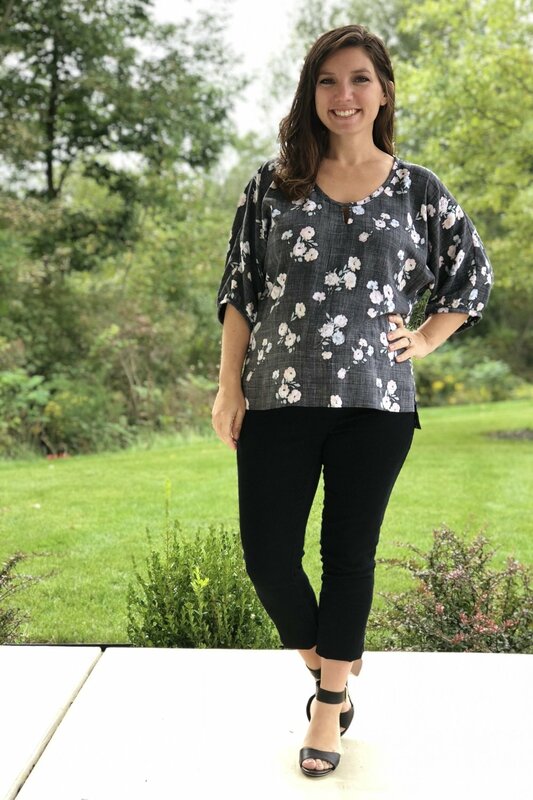 This pretty top is an easy pattern to sew for beginners, and is a loose fit to and tunic designed for woven fabrics such as such as lawn, voile, chambray, satin, challis for the top and medium weight woven fabrics for the tunic such as twill, denim, cotton sateen, brocade and blends. The pattern features a pretty gathered sleeve and a V-neckline. The tunic option comes with belt loops and waist straps for a more fitted look. Available in UK sizes 8-26 (4-22 US). It’s been a while since I AM Patterns has released new sewing patterns so we’re delighted to announce the launch of I AM UNIQUE sewing pattern collection. The collection consists of three on-trend blouses - Luna, Gaïa and Magdala. All are perfect for making and adding to your wardrobe while the weather is so unpredictable. Luna is a timeless blouse with a flat collar that gives this top a really modern look but has the option to make contrasting colour to give it am ideal balance, along with the buttons on the back. The 3/4 sleeves are a great option for the office or for layering up. This is definitely our favourite from the collection! Magdala shirt is such a stylish sleeveless top with ruffles that gives it extra volume and will hide a multitude of end of summer lumps and bumps! It has a button placket on the front and a classic collar. Another top that’s ideal for another of occasions that you’ll want to make in lots of different colours and prints! All sewing patterns are available in sizes 36 to 46. Gaïa is a sleeveless camisole style top with a V-shaped neckline, and a bit of a smart twist. It’s elegance lies in the links which gather the fabric at the shoulders to elevate this little top. It’s perfect for wearing every day and no doubt will become a go-to garment. of great makes for autumn winter. What’s your favourite? Simply click on the images to go direct to the Simplicity website to find out more about the sewing patterns and to buy. Dresses are great for every season. 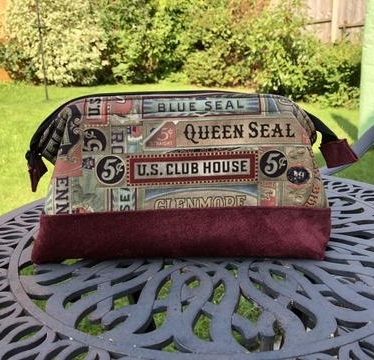 We love the latest from DG Patterns - it’s a stylish make! The Ayza Top and Dress PDF sewing pattern from DG Patterns has a classic silhouette and would be a gorgeous addition to your transitional wardrobe. The dress and top highlights one-of-a-kind design features and is a super easy to wear style with a halter neckline style and fitted bodice. 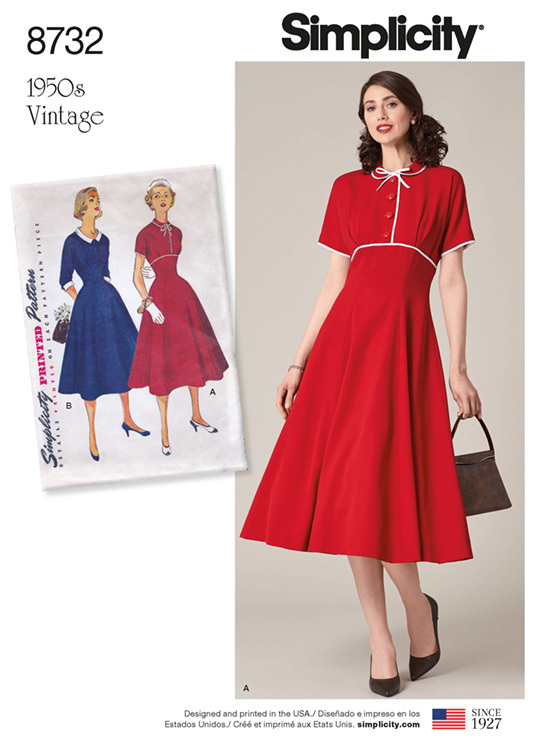 The dress also features a pleated skirt pattern with side pockets and a below the knee skirt length but can also be made as a pretty top. 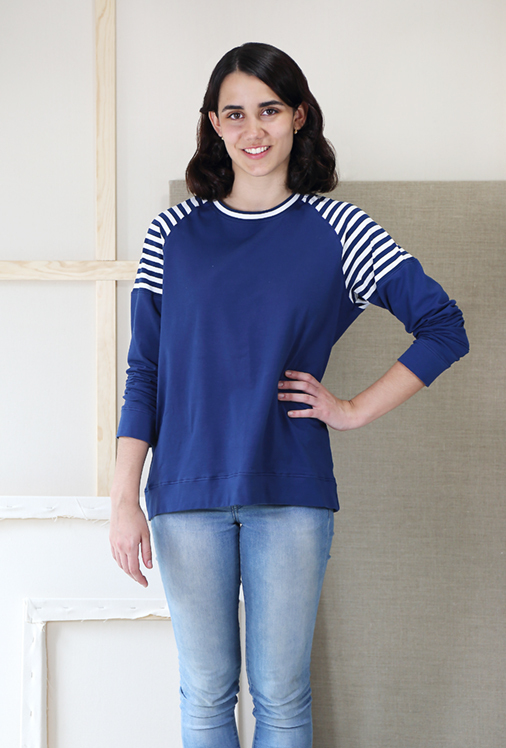 This casusal style sweatshirt from Sew DIy has some lovely detailing that will make it stand out from the crowd! This cropped, oversized sweatshirt with drop-shoulders and dolman sleeves narrows to the high hip. It also features a trendy shoulder yoke and two-piece sleeves with optional topstitching. View A is a crew-neck and View B is a scoop neck. Choose either the bracelet length sleeve or the extra long for a slouchy fit. This casual and sporty style is easy and fun to wear. Wear it to the gym, for wlaking the dog or anywhere you need an extra layer of warmth. The roomy fit pairs well with jeans and leggings for everyday stylish comfort - it’s bound to become a staple grab ‘n’ go garment from your handmade wardrobe. 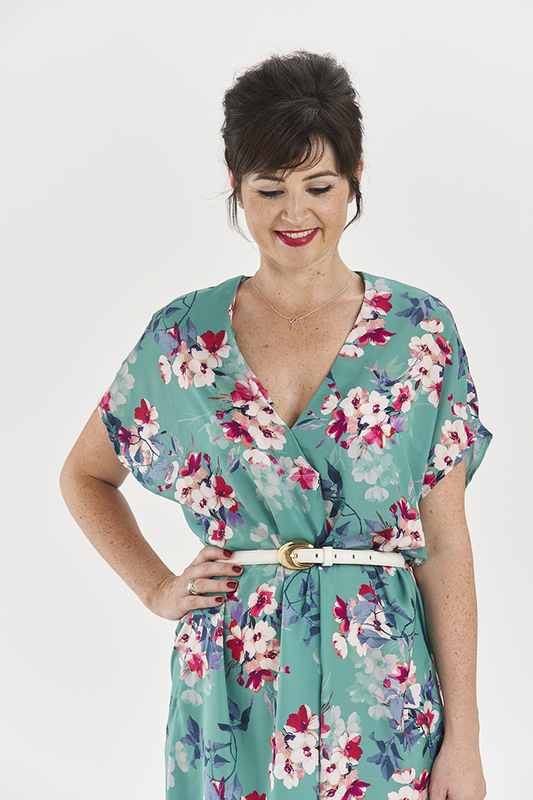 The Take Along dress is going to be the dress you want to make and wear all year round. This easy fitting dress has a shaped bodice with boat neck, five sleeve variations from sleeveless to flared 3/4 sleeves, cut-on pockets and is a shape that is flattering on all figures. The dress finishes from mid-thigh to a modern above knee length (lengthen or shorten for your perfect length). The Take Along dress will be become your favourite dress to sew and wear, with it’s classic sportswear shape, and it’s incredibly simple instructions. The Take Along dress looks as good in athletic wicking stretch fabric as it does in a stable printed stretch Ponté. Embellish the dress with appliqué, heat-transfer vinyl, or make it in border print or printed panel fabrics. The cut-on pockets are flattering and practical. The sewing instructions feature full colour photographs and just 9 steps to construct tso it’s perfect for beginners to make successfully. It’s designed for moderate to stretchy knits such as ponte, scuba, rayon lycra, ITY, cotton lycra and viscose lycra. 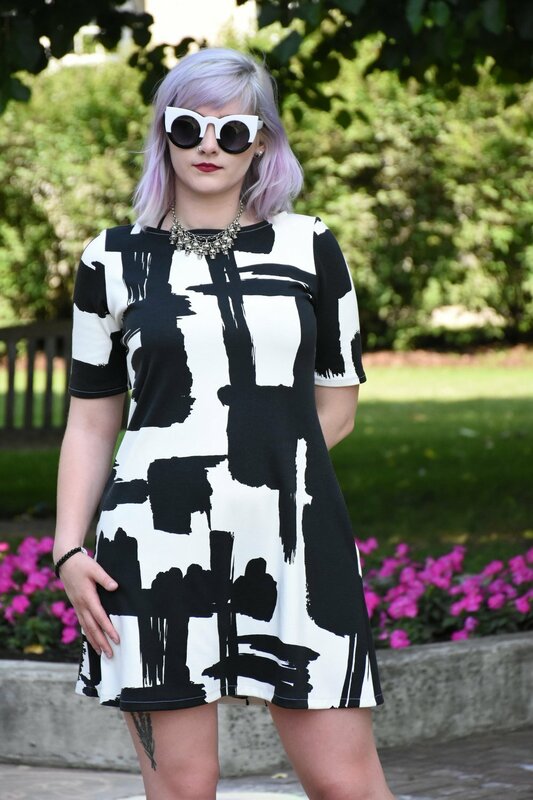 Designed for woven fabrics, the Cora top/tunic dress PDF sewing pattern from Sew Over It is a wonderful speedy make! The Cora Top is a breezy, easy-to-wear staple that you ‘ll wnat to sew more than one of! Simple to make but with lots of fun details, which can be easily dressed up or down. Pair with your smartest tailored trousers for work, or style with your most comfortable jeans for the weekend. It can be worn tucked in or loose. The Cora Top features a V-shaped neckline finished at the front with a pleat detail. The back also sports a pleat, which cleverly creates the appearance of a yoke, and keeps the shoulders that little more fitted. The grown-on sleeves are simple to sew, while the high-low hem is kept interesting with shallow angled side slits. As well as the top version, Cora also comes with the option to be lengthened into a kaftan-style tunic dress. There are no darts or gathers required, which makes it a speedy project but also it’s great for bold large-scale prints. With just four pattern pieces, it’s a fantastic project and works best in lightweight woven fabrics with a good amount of drape such as rayon or viscose and lightweight crepes for maximum drape, but you could also use a lightweight linen or cotton voile. 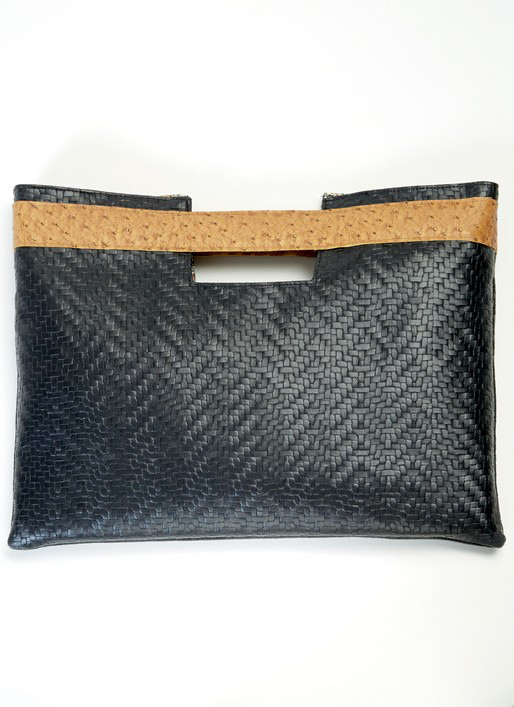 The pattern comes in a good range of sizes between 8-20 UK. with this faux wrap dress! The Petaluma Faux Wrap Dress gives you the benefit of the flattering shape but with the convenience of a traditional, back-zipped dress. The A-line, petal-shaped skirt includes functional in-seam pockets and the dress also offers three different sleeve options — Short, double petal and butterfly sleeves. It features options for A, B, C, D and DD cups, unlined wrap top/skirt style with invisible back zipper, in-seam skirt pockets and optional sash which can be tied in front or back. Itch to Stitch has designed this pattern for intermediate sewers and it’s availbale in sizes 00–20. 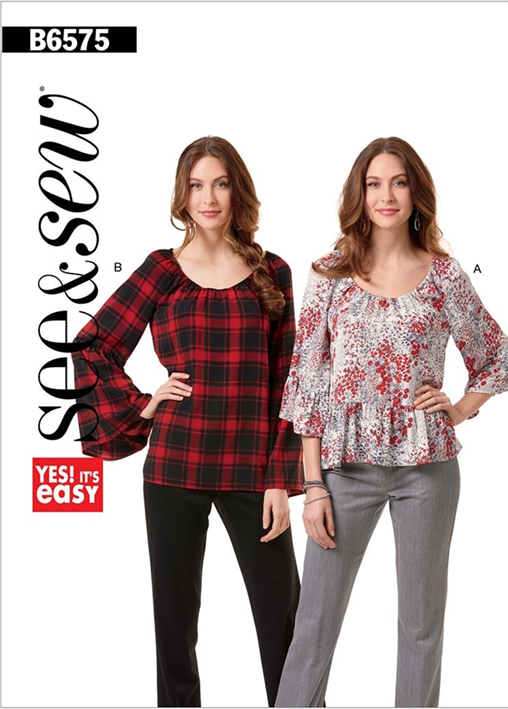 Butterick has just released its autumn/winter sewing pattern collection. Here’s some of the great sewing patterns to sew. Just click the images to find out more about each of the sewing patterns. Afternoon Tea Blouse is a semi-fitted blouse which features a fun shoulder detail to make it extra special. 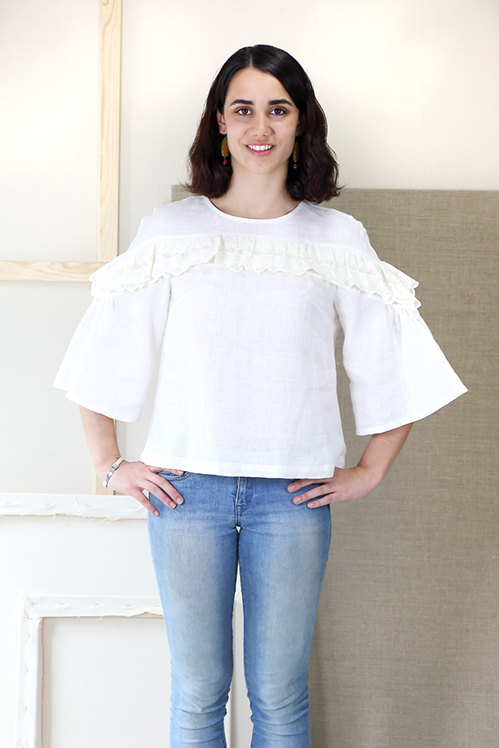 This contemporary take on a vintage blouse eliminates the shoulder seam so the sleeves are easy to sew. 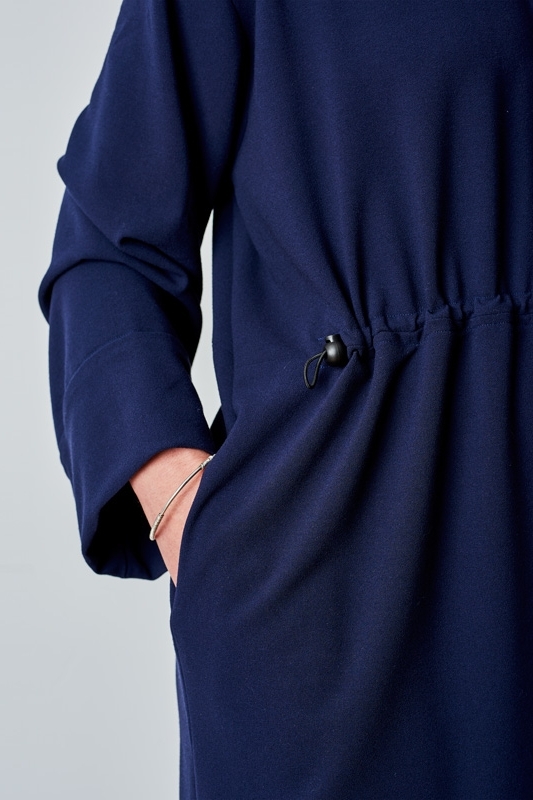 The inset panel forms a pretty chevron over the bracelet-length flounce sleeves, and the back features an easy keyhole opening with a button-and-loop closure. This pattern includes separate pieces for A/B, C, and D cups for ease of fitting. Neighbourhood Sweatshirt + Hoodie is a versatile raglan sweatshirt designed specifically for knit fabrics that can be sewn either as a front-zip hoodie with princess-seam details and a kangaroo pocket or as a pull-on sweatshirt with colour-blocked sleeves. Slightly boxy in shape with a double-fold hem that dips a little lower in back for extra coverage, both styles include a contrast-fabric detail and the pieces can be mixed and matched to create other unique styles. Hollywood Trousers are fitted, moderately high-rise, wide-legged trousers and will have sewists looking and feeling like a classic movie star. This sewing pattern includes a traditional zipper fly with fly shield, back darts for shaping, and optional front pockets with menswear-style pocket stays for a smooth front without gaping or bulging. Traditionally, they were worn ankle-length and over shirts with or without trousers (for men) and over a caftan for women. The Djellaba protected the wearer from the desert sun as well as the cold nights. 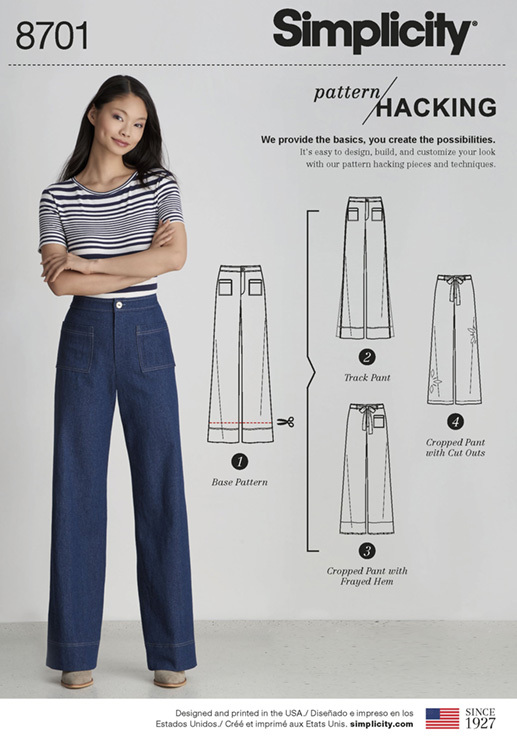 The sewing pattern features square sleeves, pockets, and four versions and comes in two lengths: ankle-length (traditional) or upper calf-length. Make it with a zip front or as a pullover then just add your own trim for a one-of-a-kind garment. It's perfect as a beach cover up, around the house robe, jacket or simple dress!